Most people who work for teacher unions are themselves members of a separate union, called a staff union. They collectively bargain internal contracts with union executives and managers on the opposite side of the table. When negotiations don’t go smoothly, it puts union managers in a delicate spot. They sometimes find themselves cutting budgets, laying off workers, reducing benefits, or generally exhibiting the kinds of behavior for which they excoriate school district administrators. On the one hand, people who work for teacher unions receive generous salaries and benefits, much better than the teachers they represent. On the other hand, union managers can be just as awful and arrogant as any in the corporate world. One recurring complaint is that union executives show little respect for the people they supervise. 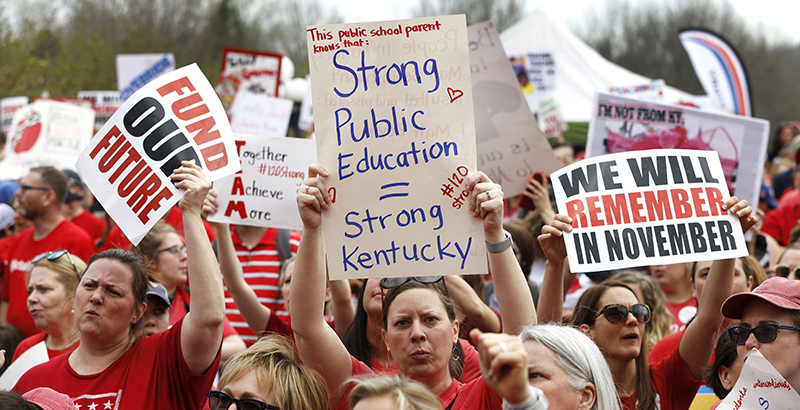 Employees of the Kentucky Education Association are currently trying to negotiate a new contract with their managers. They reached a tentative agreement last September, but the rank-and-file staffers rejected it, sending both sides back to the bargaining table. In order to increase pressure on KEA managers, the staff union has taken to forming informational picket lines in front of union headquarters. There have been many disputes of this type over the years between teacher union employees and managers. Most of them are resolved before any extraordinary job actions are taken. But there have been occasions when staff unions have gone on strike against teacher unions, and one of those times was in Kentucky. In January 2000, KEA employees went on a strike — not just for higher pay but also because union managers wanted to tie any pay increase to keeping membership levels above 28,500. It was bad timing for the union because it was in the midst of lobbying for a collective bargaining bill in the state legislature at the time. Vice went on to advise KEA employees on the procedure to resign from the staff union. As you might imagine, this didn’t sit too well with the workers. They went on strike for six days, ultimately reaching a satisfactory settlement. The collective bargaining bill died in the legislature. Teachers rarely benefit when unions have internal labor disputes. Many times managers will cave in to employee demands in order to avoid the embarrassing press coverage a staff strike will bring. This results in higher dues for union services. But when unions resort to layoffs and benefit cuts in order to balance budgets, it emboldens school administrators to use the same methods, to the detriment of teachers. What we can all learn from these conflicts is that collective bargaining is not a battle of good vs. evil. Desires are infinite and resources are scarce, leading to differences of opinion about how they should be allocated. Just as the television series Undercover Boss exposes out-of-touch corporate managers to the daily tribulations of their employees, staff union negotiations expose dyed-in-the-wool unionists to the tribulations of dealing with the demands of organized labor. I don’t know if that premise would make it as a reality series, but it can still entertain and inform us.